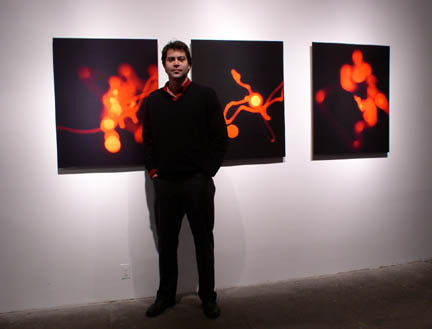 >>Stoff Smulson was born, raised and educated in Washington, DC, where he continues to reside. He graduated from Georgetown University in 1992 with a bachelor's degree in English. >>Stoff spent early years pursuing a career in journalism, with stints at Roll Call newspaper and C-SPAN. He then worked for many years at Everybody Wins!, Washington's largest children's literacy program. During the summer of 1998, he taught a poetry workshop to the students at John Tyler Elementary School, located at 10th & G Streets, SE on Capitol Hill. >>Stoff has visited the museums and galleries of Washington throughout his life. He spent a recent year as an Exhibition Aide at the National Gallery of Art. Since 2000, Stoff has co-managed Decatur Blue, a critically-acclaimed art studio, collective and gallery based out of Washington. Good evening everyone. Its a great honor to have this opportunity to talk with you tonight about my photographs. Especially in front of my family and so many dear friends. The Cosmos Club has been a great source of inspiration to me over the years and I d like to thank my parents for offering me the oppurtunity to experience everything the club has had to offer. This includes the Cosmotographers of course and Id like to thank Jim Blair for asking me to be here with you tonight. Id also like to thank Dolph and Mary Hatfield for their continued support. And Id like to dedicate this lecture to the memory of Fred Maroon, who--with his lovely wife Suzy--allowed me into his life and his photography. Tonight I plan on showing you a selection of photographs that span my life with a camera in hand. Ill start from some of the first photos I took back in high school when I first picked up my fathers Canon to the photographs I recently exhibited at a downtown art gallery. Well start with photos of Washington, because Im a hometown boy. Then well go to New York because this hometown boy loves the big city. Well travel out West--a photographers dream-- and then back here to DC and to the creative influences of Decatur Blue--a dynamic art collective I co-founded with some other local artists who were lucky to have with us in the audience tonight. This first photo is taken, as many of you may recognize, in Dumbarton Oakes up in Georgetown. Its a photo from my fourth roll of film I ever shot, which happenned to be Infra-Red film. It was a high school photography class project and it really got me hooked on photography. There was wonderful light in the shade of those big trees and my pleasure of controling the composition is clearly on exhibit here. Of course the architect of the garden helped out with a lovely construction of the stairs and fountain. But the simple elegance of this photo gave me an early confidence with my ideas of composition. This photo was taken about ten years later. I was given a tripod as a gift and went out to capture the beautiful stillness of this city at night. This photo is called NIGHT CAP. There are a good number of copies of this particular photograph across the country and around the world. This next photo was taken by the Hirshhorn Museum, just atop the sculpture garden there. That same wet night I was walking along the mall, I couldnt help but notice how lovely and stately the National of Gallery of Art looked. I currently work at the National Gallery, so I figured it would be good karma to include this photo tonight. Washington is a great walking city. It seems here that someone walked right out of there shoes!! The funny thing about this photo...I was walking down 18th street in Adams Morgan with a friend one day. A woman stuck in traffic asked us for the time. We told her and she noticed my camera. Then she pointed over our shoulders and said, "Now thats a cool photograph." She was right! It had just rained and the light had that soft brightness. I love the texture of the alley and the intrigue of upside down abandoned shoes. The lesson here is to keep your ears open just as much as you keep your eyes open. As much as Wahington offers, it sometimes just doesnt compare to New York. Everything is different up there...the light, the pace, the people, the history, the buildings, the art. Its an inspiring place to be. This photo of the Chrystler Building was taken on a blustery spring afternoon atop a nearby building. The bright sun called me up to the roof of my friends apartment building. I used a red-filter and i really enjoy the silver tones it delivered to this photograph. Heres a poem I wrote in New York one early morning as I waited in the cold for the Public Library to open at Bryant Park. in confidently starched collars or the deformed smiles of the crazies. Then every once in awhile you can be alone in the sun and listen to the men yell and the women in their sweet silence. The old man will sit next to you and talk about his stocks as the shadows of the others turn to silver at midday. Somehow the time life begins and ends in the silver city. is hustling and bustling with people from all walks of life. New York is a magical place. I call this photograph, Magic Over the City. This photo was taken from atop the Empire State Building. I love capturing the light of exsitence here. This next photo is another capturing of the light of exsistence, more natural. This is a close-up of sunlight shimmering on water. A very quick shutter speed here. As we go back and forth, notice the similarities. These are the poetics that I find integral to photography. I couldnt believe being on a subway car alone in the middle of the day in New York. The silver city is full of surprises. The great public library on Madison Avenue is a beautiful place to visit in New York. Its an oasis from the streets, but certainly not an escape from New York. This is a photo of the chandeliers in the lobby. Its one of the first times I began to think about a composition of light sources. During one of my many visits to New York, I was staying with a friend in Hoboken, New Jersey--just across the Hudson River from Manhatten. I had decided to take the ferry boat into the city and was hoping for something interesting while on the water. While we waited to board the ferry, I spotted this old Scooner turning up the Hudson. I scampered out of line and walked done to an isolated part of the docks and began taking a series of photos of this most beautiful scene. This first compostion here is a bit cluttered with the details of the dock--an old dangling rope, overgrown weeds, and random fences. This second composition is so much more refined and balanced. Its wonderful how the sails of the boat echo the shapes of the skyline. The dark silohuette of the angled dock roof and the sturdy beam add interesting flow to this composition. And of course the elements of past, present and future make this a very powerful image. In the spring of 1998, I read Stephen Ambroses great book about the Lewis and Clark expedition, "Undaunted Courage". The story inspired me to head out West myself and that summer I had my ticket and was on my way. Before I left, a friend at the National Edowment for the Humanities wrote a letter to Mr. Ambrose on my behalf expressing my interest to meet and photograph him. He agreed and after arriving in Colorado, I drove up to Helena, Montana and spent a couple of hours at Mr. Ambroses house with him and with wife. He was a busy man at the time, writing a couple of books. We spoke of his newfound fame and his work with Steven Speilberg and Tom Hanks on the movie "Saving Private Ryan" and other projects. I tried my best to keep up with him about Civil War history and his latest project, a book about the transcontinental railroad. And of course we spoke about the adventures of the Lewis and Clark expedition. This portrait of Mr. Ambrose was taken in his house against a backdrop of a National Geographic Map of the World. Here is Mr. Ambrose holding an original copy of "The History of the Expedition of Lewis and Clark" by Paul Allen, published in Philadelphia in 1811. The West is a photographers dream come true. I hiked about 5 hours to get to this vantage point to shoot Heavens Peak in Glacier National Park in Montana. The West is full to the gills of interesting and hardened characters. This gentleman I spotted walking down the street in a small town in Colorado. We spoke for a little while about things before I asked him if I could take his portrait. His name is Melvin Gore, a veteran of World War two. He told me he was still angry at Harry Truman for dropping the bomb on Japan. There is a great, clean, bright light in the West. This photo of a wild sunflower under the hot sun still makes me feel warm when I see it. There are great patterns in the West, old dried out and weathered by the elements. Patterns of this sort. One of the aspects of the West that has intrigued me for some time are the ancient native cultures that thrived throughout the area. This is a photo taken at Hovenweep, an old Anastazi dwelling in the Four Corners area. Water was such an important commodity that the Anastazi tribes protected small valleys like this with fortress-like structures. The mountain in the distance has an interesting story to it. It is called Ute Mountain and legend has it that it is a Ute Chief lying on his back asleep. He will one day awake and rise to reclaim the land from the intruders. Here are the Tetons. I chose this photo because I like how the famous mountain range falls into place, sandwitched between the flowing wheat field and the big sky. This was taken from the less populated western side of the range. From this old farm road. I traveled down to Arches National Park in Arizona in search of desert warmth. I thought I had a somewhat unique photo here with a nice big moon rising along the side of this rock formation. Then I bought a local paper the next morning and saw this exact image in the upper left-hand corner of the front page where they wrote the days weather report. Nice try. Another photo of that rising moon from a differnt part of the Park. I was surrounded by about five other photographers after I started taking this photo. Its tough to find the unique image out west or anywhere for that matter. One last photo from Arches park, this time off the beaten track a bit. Same moon. I like the balance of this composition. Just to show you that I do in fact use color film and actually know when to use color film... here is a double rainbow that came to life in the middle of a hail storm in the northern reaches of Glacier National Park, not far from the Canadian border. I dont know how the sun managed to break through the dense storm clouds that afternoon. But it did and the light was just spectacular as I stood there on the edge of that lake. I learned early on about the different qualities of light. Here is a photo of my Mom from one of my early rolls of film. And here, both my Mother and Father help me out by taking full advantage of the glorious setting sun light at our mountaintop cabin in West Virginia. These next four photos are a series of photos I call the Liberty Series. There is a graceful beauty to the silver dollar, the Liberty coin. My idea here is a transcendetal idea, where I am attempting to equate the concepts of liberty and god with the strength and beauty of nature. There is much mystery in all of these concepts and the simplicity of these compositions allow for the room needed to explore those mysteries. I used very slow film for these still lifes, Ilford 50, a tripod and natural light. In January of 2000, myself and four other local artists came together to form a studio. We found a 2,000 square foot space above a body shop in the Shaw neighborhood of Washington, not far from Howard University. In naming the place, we chose to honor the location where our studio was located. Just down the street from our space was the new African American Civil War memorial. Surrounding the central sculpture are metal plaques with the names of the 200,000 african american soldiers who fought for the Union during the war. One of those names was Decatur Blue. He faught in the 42nd infantry division. We borrowed the name and received the blessing of the statues benefactor, former Council Member Frank Smith. We got busy turning Decatur Blue into an alternative artspace--a term becoming more and more familiar in creative circles today. An alternative art space is where commercial concerns are mostly left at the door and where artistic innovation is free to mix with the ever inspiring elements of beauty, fear, order and chaos. I built a darkroom and started develping prints. My studio mates used whatever space they needed for their own projects. We bought track lighting and painted the walls. Within three months, we had our inagural opening and exhibited our work. It was a tight show, all the work fit together so perfectly--as it should having been made together. That first opening night was rainy as hell, it even ended up snowing. But the crowd was huge and the scene was set. Its been three years since that first opening. Weve added two new members to Decatur Blue. Most of the guys are here tonight. Feel free to talk to them after my talk, theyd be happy to share some war stories with you. Weve done some amazing things together. Weve hosted more than a dozen art exhibits--some that rival museum shows that Ive seen. We even had the honor of exhibiting the photography of Fred Maroon. We just published a catalog that includes a music CD compiling songs from 20 local bands that have played at our studio openings. A curator from the Whitney Museum in New York came to visit us in November and we are hoping that one of the members of the group will represent us in the 2004 Whitney Biennial. Weve not only inspired others, but more importantly we have inspired eachother and Id like to take this opportunity to thank the Decatur Blue guys for everything they have done. This particular photo is of the floor of Decatur Blue. It represents the many layers that makes our group so unique. It also shows just how committed we are to the hard work that being an artist is. This is a photo of an installation we created as a group project. One day, a house across the street from us collapsed on the worked renovating it. It was an old brick rowhouse with a lot of character. I sat there watching as the city came in to push the building completely down for understandable safety reasons. When all was said and done, a heap of dusty bricks was all that was left. I thought of all the lives that had been lived in that old house, all the loves that had been loved, the dinners that had been eaten, the stories told. And so when night fell, I rallied one of the other guys to race over and grab some of the bricks with me. We had to build something with those beautiful salmon colored bricks. This circle is what we created. It was the load of two of us. Later on that evening, a third member of the studio helped build another circle nearby in the same room--that one a little bigger because it was the load of three of us. We called the piece "Regeneration." It was a lovely project, driven by the spontaneous desire to create and honor. This woman had a second-hand store across the street from Decatur Blue. This is the only time I ever saw her and one of two times I actually saw the store open. Her stern face contrasts so clearly with the open sign. This is the best smile I could get from her. The broken and splintered spot where her hand rests against the door frame attests to the harshness of the neighborhood where we worked. I try to imagine her story, I wish I had the chance to get to know her better. But such is usually the nature of photography--a moment captured in an advancing lifetime. At least we have the moments to cherish. As I walked around the neighborhood where Decatur Blue was located, I started photographing some of the graffiti on the walls of the buildings. Ive always found graffiti so raw, sensual, instinctual, public. I would compose photos using combonations of graffiti...I took liberty to edit down the pieces. And then I started noticing similarities between these photos of graffiti and photos I had taken of the moon over the years in which I leave the shutter open for a few seconds and move the camera about, esentially using the moon as a brush or moreso like a can of spray paint. This next series of photos interchange between street graffiti and what I call my moon graffiti. Id like to think there is much room for interpretation and so will allow you to conjer your own ideas without my interjections. This final photo fo the Graffiti Series has a nice human touch to it...I was in San Francisco and happened at the time to be doing some street photography. This one block had some great graffiti and I was taking a picture of the graffiti behind this gentleman. He walked up to me as I was doing so and asked me: "Do you know what that means?" To which I replied "No, what does it mean?" He blurted back "I dont know man!! I thought you knew, youre the one taking a photograph of it!!!" We laughed and talked for a bit, sharing our ideas about this and that. He asked me if I made a living out of photography and I replied :"Sometimes." I asked him if I could get his portrait and he said sure. I love his expression and his stature. There is something wild, yet contained about him. Here is another portrait I did that afternoon in San Francisco...of some beautiful and very approachable women in chinatown. "So also with the shadowgraph which i wish to show here, an inward picture which does not become perceptible until I see it through the external. This external is perhaps quite unobtrusive but not until I look through it, do I discover that inner picture which I desire to show you, an inner picture too delicately drawn to be outwardly visible, woven as it is of the tenderest moods of the soul." The works from the Shadowgraph series involve a very active photography process. It usually begins with an initial exposure of an image and then the active development of the photography paper by which I splatter the paper with the develping chemicals. This all occurs on the floor of the darkroom and and in this particular case involved the use of a flashlight to get the echoing graffiti-like movement of light. The size of this peice is 16 inches by 40 inches. This detail of the image give you a good idea of the different layers being created. Here you can see the underlying image is an American flag, with these distorted and barely visible stars. Here is another Shadowgraph, this time the size is roughly 4 by 4 feet. The underlying image here is of the World Trade Center. This detail shows you a little better. And here is the orignal photo. This is a smaller--8 inch by 10 inch-- shadowgraph. The gentle metalic rose color that precipitated from the active development process worked out very nice here. One of the joys of experimenting in the darkroom I have found, is the surprise of the unexpected. There is freshness inherent in experimenting, a rise to the unknown and and then more still to the unknowable. Here is the original image, an architectural detail of the Capitol Building. The soft rose tones here enhance the sensuality of this figurative piece. Heres another figuartive piece that starts us in to the next series of cubist inspired photographs. This particular photo is two photographs combined to form one concept. The underlying image here is the photo I showed early on of the abandoned shoes in the alley. Last spring I picked up a book about Cubism by Paul Waldo Schwartz, a noted art critic from the New York Times. While I read of the influence that the fast-changing and newly-defining world had on Picasso, Braque and the other cubists in Paris in the early years of the twentieth century, it became clear to me that today we are experiencing similar changes and re-definitions in these early years of the twent-first century. Whether we like it or not, there are forces that are re-shaping our reality. And I often find these forces dis-orienting, and this is something I attempt to convey in this series. And so under the influence of this book, I began experimenting not in the darkroom, but with an aggressive active style of the taking of the photograph. My camera allows me to take multiple exposures, and so I went about taking photos of subjects from different angles and perspectives, all on the same frame. These are moody compositions, subtle, a bit dark, dis-orienting. Here are some of the still lifes that I composed. Here is a photo I took in Venice this summer. My Bella and I had visited Peggy Guggenhiems wonderful collection that day and were wandering the dreamy city under a full moon. This purposely out of focus composition employs the moon, lamp lights and hanging sheets on a clothes line over a small canal. The elements combine to become more than a photograph, it is more a dreamscape, an impulse of that day in Venice, captured in a unique way that will never be relived. It is my special idea of Venice. Here is another out of focus composition. These are the lights of cars waiting at a light. This is a great example of how an artist can constantly find beauty surrounding him--it is a quality that can at times be sublime, and at others perilous. These two photographs are simply color compositions. But like the Venice composition, they abstarctly capture a unique Decatur Blue space and time for me. I want to end with three photos that I recently exhibited at Signal 66, an influential alternative art space in downtown Washintgon. These are Moon Graffiti numbers 8, 9 and 10. I had them printed large, roughly 3 by 4 feet, and had them mounted without frames. They are digital prints, but are not digitally enhanced images. The reds and oranges you see are due to the use of a red filter and the full moon. These are poetic pieces...aesthetic...original and alive. "What does photography mean to you?" My answer is that photography is life lived in the light of existence. Id like to end this presentation with this poem by Robert Frost. He is no fugitive - escaped, escaping.